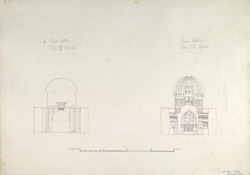 Illustrations of the cross section of Cave IX and XIX at Ajanta from James Burgess' 'Original Drawings from the Buddhist Rock Temples at Ajanta.' The 30 magnificent cave temples are situated in a horse-shoe valley of the Waghora River in West India and consist of prayer halls (chaityas) and monasteries (viharas), built for the Buddhist community who lived there. The first group was excavated between the 2nd - 1st century BC. After a period of more than six centuries, the excavations restarted around the 5th century AD in the Vakataka period. Cave IX is one of the earlier caves dated to the 1st century BC. This chaitya hall has a rectangular plan divided into three aisles by two rows of octagonal columns. The vaulted ceiling used to have timber ribs. At the end of the central apse there is a hemispherical monolithic stupa representing the devotional focus of the cave. Cave XIX is an elaborate rock-cut chaitya hall from the late 5th Century. The external facade has a large horseshoe-arched window flanked by figures of yakshas and Buddhas carved in relief, above a columned portico. The outer walls are decorated with carved figures of seated and standing Buddhas, and columns embellished with scrollwork, foliation and jewelled bands. The side chapels on either side of the facade have columns with carved pot and foliage capitals.